Robert W. Crompton was many things — artist, writer, advertising man, outdoorsman, fly fisherman — but we remember him best today as the father of the five strip bamboo fly rod. Noted bamboo rod maker and author Robert D. Smith has uncovered the fascinating history of this overlooked rod making genius, from his nineteenth century origins to the heights of his advertising career when his work was seen by millions of Americans to the accident that ended his career as an artist and propelled him into the world of fly rod making. 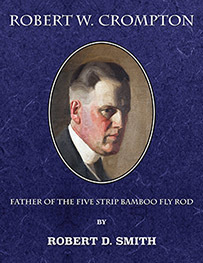 The book is divided into four parts: the first reproducing all of his known writings on subjects from fly lines to camping; the second brings together all his rod making writings, including his unpublished rod making book; the third is a detailed biography of his life and career; and the fourth section covers his fly rods and fly rod taper designs. 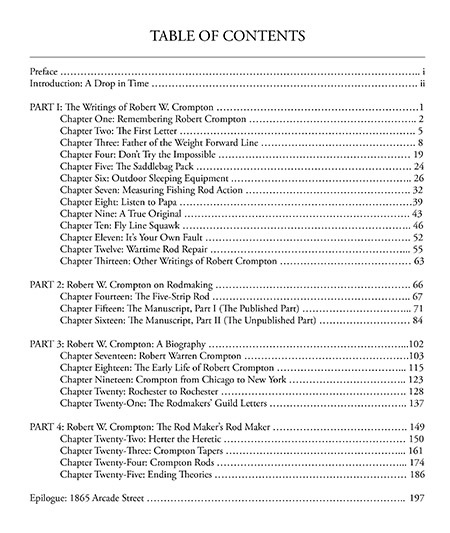 This book will be a revelation and will help modern readers understand how deeply influential Crompton was on both fly fishing and rod making. This definitive biography and collection of his original writings (including his unpublished rod making manual) is the product of five years of labor. It includes dozens of color and black-and-white images, as well as all images reproduced from his original writings. It is a must for anyone interested in fly fishing and fly rod history, making bamboo fly rods.